15 tracks: Poacher’s Moon * Where You There * The Strangers * World Cup Fever * The Ballad Of Charles Devonport * Progress * Marking Time * Campbell’s Daughter * One Small Star * Listen To The Old Ones * The End Of An Auld Song * Cuddy River Reverie * Old And In The Way * Kissing English Arses Talking Blues * Standing In The Light. This joint Australian/Scottish project was the first of its kind to be released by Greentrax, and the second release in celebration of the Greentrax 10th Anniversary in 1996. 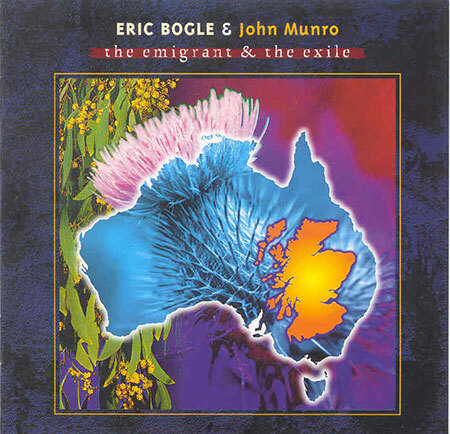 The idea of an Australian/Scottish album was suggested to Eric Bogle by Ian Green. Eric and John Munro, aided and abetted by Brent Miller, recorded fifteen songs with guitar, bass guitar and mandolin accompaniment in The John Reynolds Studio, Adelaide, Australia. The multi-track tapes were then flown to Scotland and at Pier House Studios, Edinburgh, additional instrumental backing was dubbed on to the Australian tapes by Dougie Pincock (pipes, whistle, sax), Phil Cunningham (accordion, keyboards), Ron Shaw (cello), Duncan MacGillivray (harmonica, guitar) and fiddle, concertina, bouzouki and keyboards by Brian McNeill (who produced and mixed the album). Ten of the songs were written by Eric Bogle, four by John Munro and one is a joint effort, resulting in an album which is very ‘Scottish’ in both lyrical and sound content, and is great value at over 70 minutes playing time. Songs which we in the Greentrax office particularly enjoyed include Poacher’s Moon, on the subject of poaching Tweed salmon (by Eric); The Ballad Of Charles Davenport, of a child born to a single woman during World War II (by John Munro); Campbell’s Daughter, an ‘instant traditional song’ (by Eric); The End Of An Auld Song, an exile’s (Eric’s) view of his homeland; and the hilarious ten-minute long Kissing English Arses Talking Blues (play it on radio if you dare! ), in which Erchie ‘Aristotle’ MacGillicuddy makes a (thankfully short!) special guest appearance. And there are many more gems, covering various subjects as diverse as World Cup Football and the Scottish folk scene. The concept of recording an album in two countries so far apart was fraught with difficulties but the end result makes all the effort worthwhile.